Slay: Give friendly Orcs +1/+1. Steelheart Vanquisher is a rare Endurance creature card. It is part of the Heroes of Skyrim expansion. "Let us please Mauloch with our deeds." 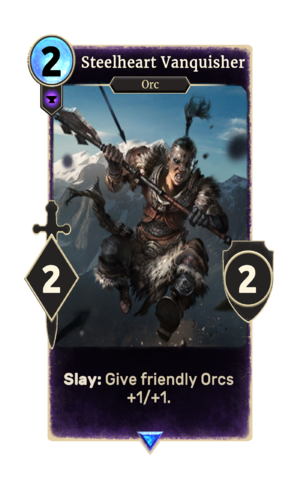 This card's slay ability applies the Orsimer Prowess card effect. This page was last modified on 27 February 2019, at 22:39.